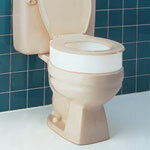 This 4 inch raised white toilet seat with lid by Drive Medical attaches tool-free to your existing toilet bowl. It is easily secured and features a locking device with a large, heavy duty worm screw and locking plate for a safe, secure fit. This dependable product is also as easy to clean as it is simple to use. Weight capacity is 350 lbs. and fits most toilets. Seat width is 14 inches and depth of 16 inches. Heavy duty molded plastic construction. Lightweight and portable. Product weighs 3.5 lbs. Fits most standard toilets. The 4 inch elevated seat will help individuals who need a boost sitting down or standing up from the toilet. For consumers using a wheelchair this product allows for easy transfer to and from the raised toilet seat.